Of Flemish origin, Roelandt Savery moved to Haarlem with his family at the age of around nine. 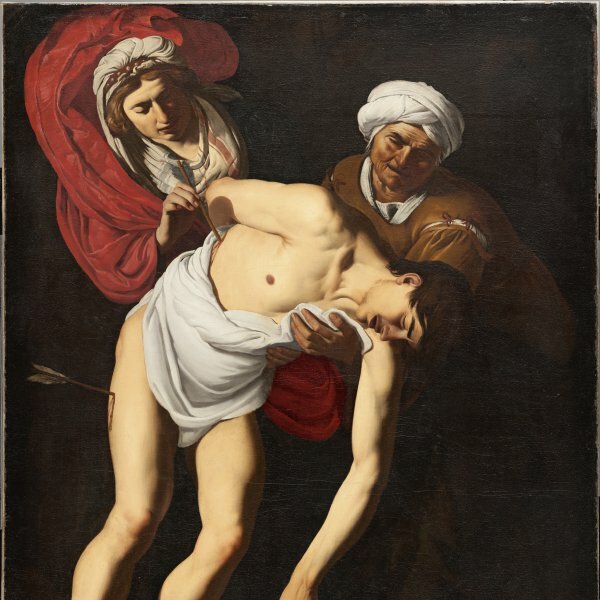 According to Karel van Mander, his first teacher was his brother Jacques but little more is known of the training and early years of this Mannerist painter. The last reference to him in the Northern Low Countries dates from 19 August 1603, after which he is documented in Prague in 1604 where he worked for Rudolf II. The latter commissioned a series of topographical views of the Tyrol from Savery, executed on paper, which occupied his time between 1606 and 1608. On the request of the monarch, Savery depicted mountain views, peaks, waterfalls, forests and other natural features in these views. The present panel, which is extremely well preserved, was in the Scottish collection of Arthur Kay, then in London where it was auctioned. It was then in Amsterdam in the collection of Frost O. Garshagen and was acquired for the Rohoncz collection in 1929. It was included in the Munich exhibition of 1930, and appears in the 1937 catalogue of the Collection. On the death of Baron Hans Thyssen-Bornemisza in 1947 it was inherited by Countess Margit Batthyány and was subsequently reacquired for the collection by Baron Hans Henrich Thyssen-Bornemisza. This signed and dated panel is indirectly associated with the commission for Rudolf II as Savery subsequently reused many of the sketches and drawings that he made on his trip to the Tyrol for later paintings executed in his studio. These preliminary studies were also used by the Dutch printmaker Aegidius Sadeler, who had produced woodcuts based on paintings by Jan Brueghel some years earlier. Mountain Landscape with a Castle is the only known panoramic view by Savery inspired by his Tyrolean views. He constructed the composition from a limited range of blues, ochres and greens, skilfully organised to structure the different spatial planes. Thus the dark ochres and browns that convey the rocks and forest in the foreground lead into a range of greens for the nearer mountains and fields, with blues used in the distant mountains that emerge from the clouds and in the river that cuts through the background planes. This jagged landscape with its high viewpoint includes the presence of man in the form of a city at the lower right, the castle, and the small figures located on a rocky outcrop. 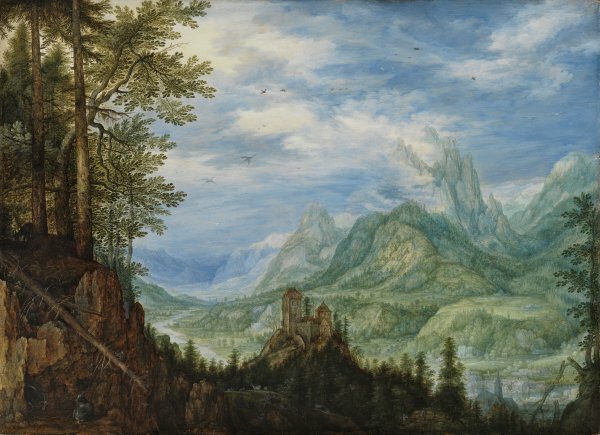 Mountain Landscape with a Castle has been related to a drawing by Savery in the Albertina, Vienna, that depicts a motif similar to the lower left part of this composition with a pronounced diagonal line created by the trunk of a fallen tree on the edge of a precipice.